GALLANT OFFICER, ABBA KYARI PROMOTED TO ACP | Youngest APC. Gallant Nigerian police detective, Abba Kyari has been promoted to the rank of an Assistant Commissioner of Police, NaijaOnlineTV authoritatively gathered. ACP Abba Kyari who got the promotion after being a Chief Superintendent of Police (CSP), got his promotion based on recommendation by the Inspector General of Police, Ibrahim Idris, for his gallantry, exceptional and superlative performances. Abba Kyari at the age of 41, is the youngest Assistant Commissioner of Police in Nigeria today. The gallant cop on his promotion showered gratitude and appreciation to the Almighty God, IGP Ibrahim Idris, The Police Service Commission, his family, friends and well wishers as the promotion had taken effect from the 15th of December, 2016. 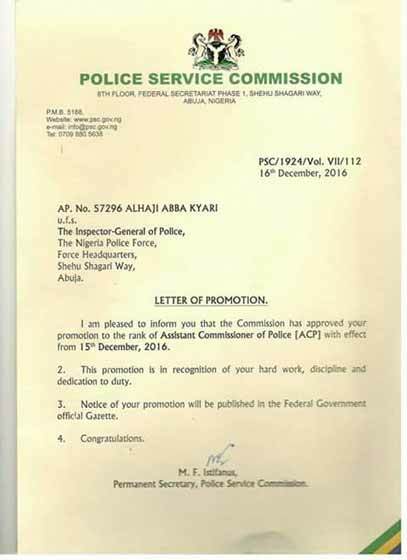 It is of note that ACP Abba Kyari’s promotion letter signed by the Permanent Secretary of the Police Service Commission, states that the promotion is in recognition of his hard work, discipline and dedication to duty. ACP Abba Kyari was formerly the officer find charge of the Special Anti-Robbery Squad (SARS) Lagos command and was instrumental and the mastermind of several arrests of known and dreaded criminals within Lagos and Nigeria ranging from feared armed robbery kingpins and kidnap gangs. For his exploits in the Nigerian Police Force, ACP Abba Kyari in early 2016, got a special Presidential award from President Muhammadu Buhari on his gallantry and performance at work. Abba Kyari is the commander of the Inspector General of Police, Special Intelligence Response Team.